If you remember this song when it first hit the airways , I need you to remove all food’s from your mouth before the next sentence. That was THIRTY TWO YEARS ago. She won a Grammy (1980’s Best Rock Vocal Performance-Female) and that’s the year I became a fan. Donna was already a star by then, however, I wasn’t a fan. Turned off by one of her signature songs “Love to Love you baby” I didn’t think much of her singing voice. In fact, I didn’t like much what she was doing during when she was under contract with Casablanca Records. Yes Last Dance was a good record, but I thought it was fluke. There are many self proclaimed Disco Queens, many one hit wonders, but Donna is the Queen selling nearly 130 million albums worldwide. When Disco faded, it ended the careers of many. While Donna’s career slowed it was far from over. Donna’ roots were in the church and inspirational songs can be found on some of her later albums . In 1982 she was a Grammy nominee for– Best Inspirational Performance, I Believe in Jesus. This is her version of Riding through the Storm. The music industry is filled with vampires , Casablanca wanted the Disco Donna, Donna wanted to branch into other musical styles… unable to reach a middle ground she left Casablanca for Geffen Records. Donna was unable to duplicate the successes and previous sales at Casablanca. While at Geffen Donna learned she still owed Casablanca an album. The album “She Works Hard For The Money” was one of her all time best selling albums. None of her Geffen sales came close. Donna Summer was the first African American female to have a video on MTV in heavy rotation. Singer,Writer, Actress, Painter, and Grandmother of four,LaDonna Adrian Gaines from Dorchester, Massachusetts belongs to an élite group of American singers Aretha, Gladys,Patti, and Tina with recording and performing careers of three decades or more. Donna’s last tour (Crayons) was in 2008. If your in New York, her next scheduled performance is in East Hampton,New York at the Bay Street Theater on the 5th of July. This is one of her last filmed performances (Dec 2009) at the Nobel Peace Prize Concert in Oslo, Norway honoring President Obama. Behind her is the Norwegian Radio Orchestra. She was 60 at the time of this KILLER performance (notice the face of the conductor). So Beyonc’e, Gaga, Adele and all the other contenders who will rise and fall. Donna Summer is the real thing, she’s been hott stuff for nearly 40 years… and she’s not cooling down anytime soon. This entry was posted in Buisness, CALIFORNIA, Entertainment, INTERNATIONAL, NATIONAL, Rumorcity, women and tagged Adele, Aretha Franklin, Beyonce Knowles, Casablanca Records, Donna, Donna Summer, Geffen Records, Gladys Knight, Lady Gaga, Love To Love You Baby, MTV, New York, Oslo, Patti Labelle, President Obama, She Works Hard For The Money, Tina Turner. Bookmark the permalink. She was a great performer, no doubt. But it’s silly and rather demeaning of her to talk about disco balls in heaven, when there really is no evidence that anyone survives their death. People live and do things and then die. The results of their actions may continue on, but notions of “resting” and partying in some celestial theme park are childish and simply wishful thinking. Let’s remember her for her great achievements, not construct some fantasy around her death. 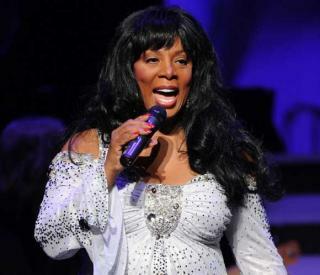 Great post at Donna Summer ” She is simply hot Stuff” SACRATOMATOVILLE POST. I was checking continuously this blog and I’m impressed! Very helpful information specifically the last part 🙂 I care for such information much. I was seeking this certain information for a long time. Thank you and best of luck.